It’s pouring, but that doesn’t dampen the spirits of a thousand sharply-dressed politicians, urban planners and other civic leaders crammed into a tent on top of Millennium Park’s Harris Theater. They’re here to launch GO TO 2040, a blueprint for making tough development and spending choices in the Chicago area’s 284 communities, for the next few decades and beyond. 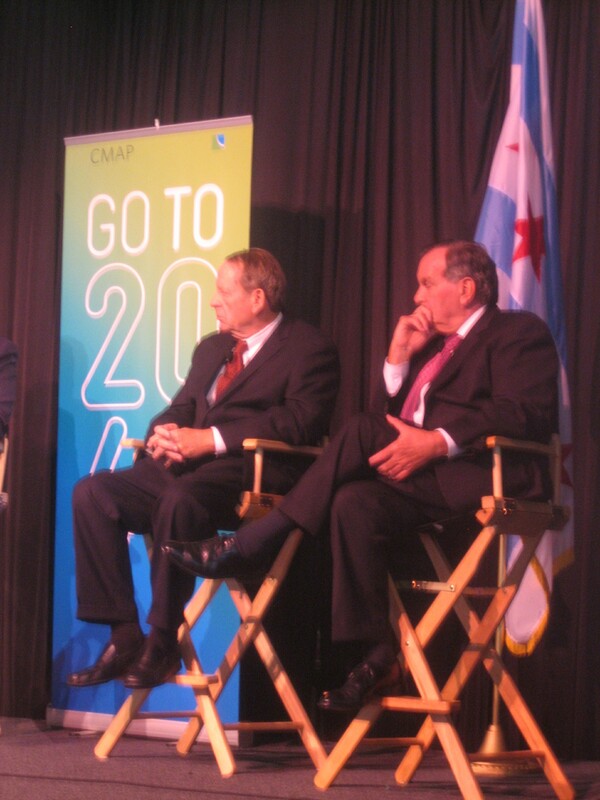 The Chicago Metropolitan Agency for Planning (CMAP) will lead the implementation process, and stakes are high. As the region’s population balloons from its current 8.6 million to an estimated 11 million by 2040, the decisions we make now will determine whether the Chicago area becomes more prosperous, green and equitable or devolves into a depressed, grid-locked, smog-choked dystopia. The plan, developed by CMAP and its partner organizations over three years and drawing on feedback from more than 35,000 residents, includes the four themes of Livable Communities, Human Capital, Efficient Governance and Regional Mobility. It makes detailed recommendations for facing challenges like job creation, preserving the environment, housing and transportation. Banners at the launch party feature GO TO 2040’s cover image, an Aurora-centric aerial view of the region, with expressways and transit lines radiating from Chicago like bolts of lightning. Considering that this is a plan for future generations, affecting people from all walks of life, it’s odd that almost everyone on the stage is an older white male in a dark suit. CMAP board chairman Gerry Bennett, mayor of Palos Hills, kicks off the proceedings by comparing the occasion to the 1909 release of Daniel Burnham’s “Plan of Chicago,” which helped create a city with plentiful parks and preserved the lakefront for public recreation. “When Burnham proclaimed ‘Make no little plans,’ he asserted that as a great metropolis we have the ability to reach for the unreachable,” Bennett says.